We are incredibly blessed to recently have the presence of the World Teacher instruct us in a new, and wonderful gift, known as the “Coronet of Light.” On 20 October 2015, the World Teacher made his presence known, along with numerous celestial beings, to a small community of believers to give instructions in how to make and pray this Coronet or prayer rope. The laity and clergy have been instructed to pray the Coronet at least on Sundays, Tuesdays, Wednesdays, and Thursdays. One of the celestial beings revealed to us that, “There is a special blessing for those who pray this Coronet each day.” Faithists will be striving to recite the Coronet daily, but where this is not possible, it is permissible to recite this on the prescribed days. 3 beads – for the Creator, the Great Spirit, the Almighty. 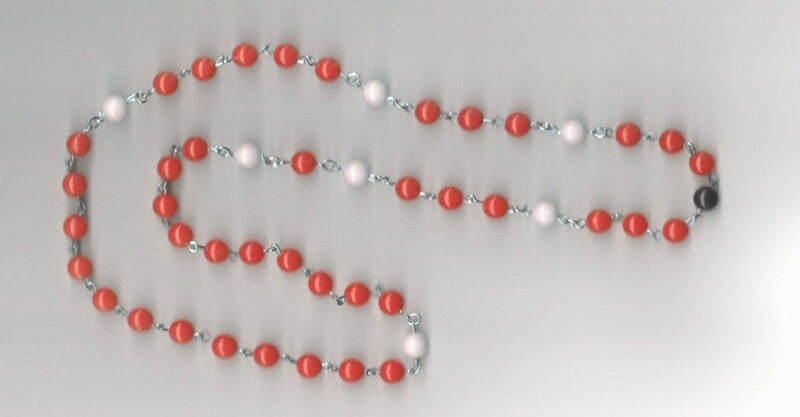 3 beads – for the I AM, the Heavenly Father, the Highest Cause. On the next twelve beads, we recite the Twelve Virtues (one Virtue per bead). 1) I will learn to find Jehovih in all things, and to love and glorify Him. 2) I will cultivate the virtue of Cleanliness. 3) I will abstain from eating any fish, or flesh, or any other unclean thing. 4) I will cultivate the virtue of Industry. 5) I will cultivate the virtue of Labour. 6) I will cultivate the virtue of Abnegation of the self. 7) I will cultivate the virtue of Love. 8) I will cultivate the virtue of Discretion. 9) I will cultivate the virtue of System and Order. 10) I will cultivate the virtue of Observance. 11) I will cultivate the virtue of Discipline. 12) I will cultivate the virtue of Obedience. 1. I will keep the Ten Commandments of Moses. 2. I will not not engage in war, nor shall I encourage or assist in the making of war in any way; I vow to be obedient unto all governments as long as they do not break the Law of Jehovih. 3. As far as I am able I will not eat the flesh of any animal, or fish, or bird, or fowl, or creeping thing which Jehovih created alive. 4. I will live dwell in families, after the manner of the ancient Essenes, who held all things in common; I will have only one spouse; the children shall honour the parents. And, to the extent that I am able, to wed only with the chosen*. 5. I will have no king nor queen in Corpor, nor bow down in worship to any. My worship is only to Jehovih. 6. I will not call on the name of angels to worship them, nor will I counsel with them on the affairs of the earth. 7. I will love my neighbor as myself, and do unto my fellow man or woman,as I would have him do unto me, returning good for evil, and demonstrating pity to those who sin. 8. I will not worship any idol; I will only worship Jehovih. 9. I will visit the sick and distressed, the helpless and the infirmed, and I will work to relieve their suffering; I will provide for the widow and the orphan, and I will strive to keep myself above reproach before all people. 10. I will preserve the sacred days of the rabbahs, and the rites and ceremonies of the brotherhood. On the next three beads, recite, as you did on the first three. 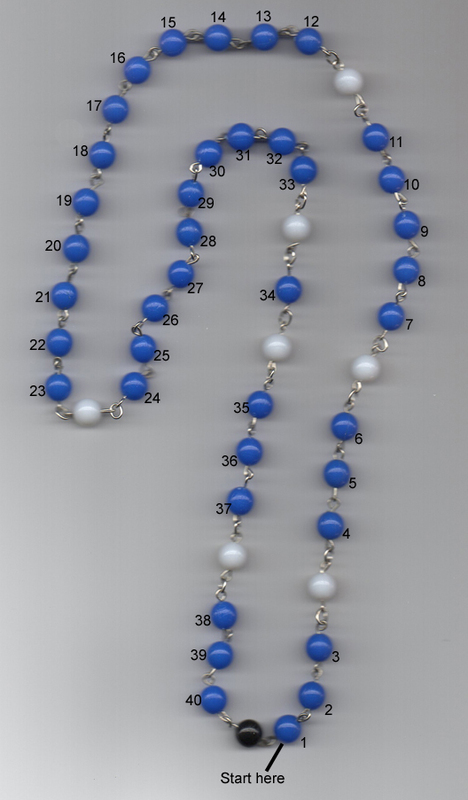 On the last three beads, recite as you did on the second set of three. Take a few minutes to contemplate these prayers. Repeat if you wish. No instructions were provided concerning particular colours or size of beads, however, you might wish to use a unique colour for the first bead to easily know where to begin the prayers. The black bead only serves to separate the beginning and end of the chain. 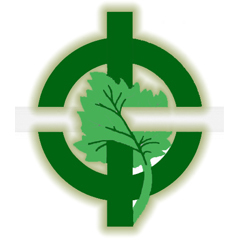 You can use an emblem exclusively used among Faithists like the Cross and the Maple Leaf etc. Please report any special favours received or experiences with the Coronet of Light. I pray that all the brethren make this a regular part of their daily spiritual practice, as it will assist you in getting closer to our Heavenly Father Jehovih.